This year, in the dead of winter, America’s wild caribou went extinct in the contiguous United States. The last remaining herd of caribou known to roam between Canada and the Pacific Northwest states of Idaho and Washington was down to just one known member. In January, wildlife managers in British Columbia captured the female and put her in a pen, where they hope she will have a better shot at survival than alone in the snowy wilderness. "It was the right move," said Ray Entz, director of wildlife and terrestrial resources for the Kalispel Tribe in Washington, which has participated in the international effort to conserve the South Selkirk herd, named for the steep mountains it inhabited. "That animal was not going to survive." For the foreseeable future, the capture put an end to the Selkirk herd in the wild, which was already what biologists consider "functionally extirpated." The herd was one of 15 isolated subpopulations of a broader group known as southern mountain caribou, which, as their name indicates, live in different landscape from the robust northern tundra herds. All 15 are shrinking, mostly because of human development that fatally altered their habitat. Caribou once also populated northern New England and upper parts of Great Lakes states, such as Minnesota, which spawned a coffee chain named for the animal. But their range steadily contracted northward. In 1983, when fewer than 30 members remained, the Selkirk herd was added to the endangered species list. The Selkirk population was up to almost 50 in 2009, but since then it has been "going down, down, down," said Leo DeGroot, a government wildlife biologist in British Columbia. An annual census found just three animals in 2018. "They have no future with one, two or three animals." Even before the recent capture, the Selkirk caribou seemed to have given up on the American portion of their range. No U.S. sightings had been confirmed since 2012, though radio collar data indicated one entered Washington in late 2014, according to a management plan by a multiagency, international group that studies the population. "They don't call them the gray ghost for nothing," Entz said, using a nickname for the animals, which have always been elusive. The mountain caribou live in inland temperate rain forests and move in the winter to higher elevations in search of what they survive the season on: furry arboreal lichen hanging from old-growth trees. Their massive hoofs - "pie plate or dinner plate, that's not an exaggeration," Entz said - function as snowshoes as they traverse the slopes. Officially, predation by wolves and mountain lions were the main cause of the Selkirk herd's collapse. But it started with humans, DeGroot said. The forest has been fragmented over decades by logging, roads, power lines and, in Canada, oil exploration and mining. Smaller foliage that grew back in its place attracted moose, deer and elk, and they, in turn, drew predators. The predators make their living off the plentiful newcomers, DeGroot said, but the caribou became "bycatch." 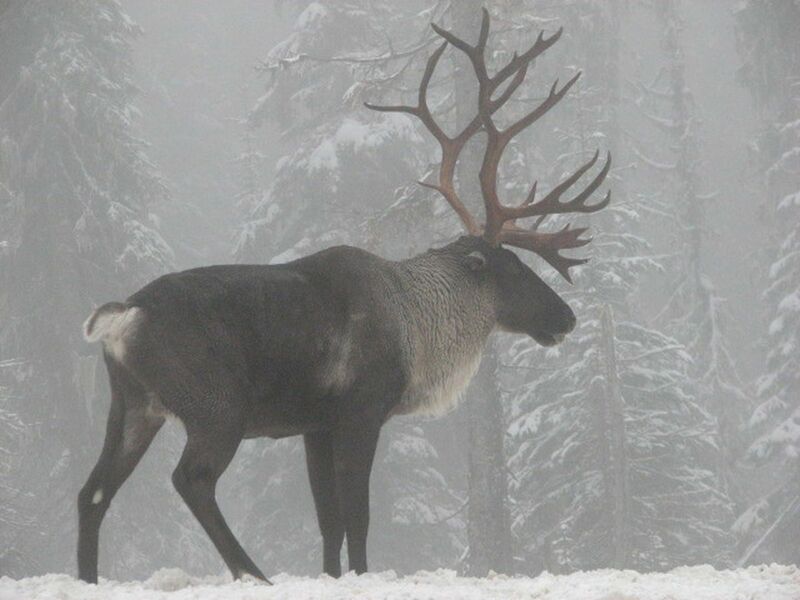 Wolf culls in Canada did not help the Selkirk caribou. "The caribou are just a more vulnerable species. They don't kick hard like a moose. They're not as skittish as a deer. They never have twins," DeGroot said. "So with these changes, they're the ones that pay the price." Canadian wildlife managers decided to capture the final Selkirk caribou after determining that one of the three counted last year - all of which wore radio collars - had been killed by predators, and the other had been missing for months and was likely dead. After the female was caught in a net shot from a helicopter, biologists sedated and transported her to a so-called maternity pen near Revelstoke, B.C. The pens are typically used as temporary caribou obstetrics wards and nurseries. Because newborns are particularly vulnerable to predators, managers move pregnant females to the enclosures, where they are fed until the calves are more than a month old. The Revelstoke pen now holds the Selkirk caribou and three others - a calf that was born there and returned after its mother was killed, and two from another dwindling southern mountain herd. The plan is to capture a female from a nearby herd who will get to know the other refugees and then, when managers release them all at once, lead them into her habitat. Canada plans to begin a caribou breeding program, DeGroot said. But any release of captive-bred animals is at least four years away, he said, and it's not clear whether they would be used to restore the Selkirk herd or another precarious one. Entz said the Kalispel Tribe, which historically depended on Selkirk caribou as a meat source, wants them back in the Lower 48. Conservation organizations echo that. Last month, the Center for Biological Diversity and two other groups announced plans to sue the U.S. Fish and Wildlife Service for failing to designate protected caribou habitat in northern Idaho and northeast Washington. The agency in 2011 proposed setting aside more than 375,000 acres, but after opposition from snowmobilers and others, it cut that down to about 30,000 acres. A federal court later ordered Fish and Wildlife to reconsider, but the agency has not issued a decision. Karin Brulliard is a national reporter who runs the Washington Post's Animalia blog. Previously, she was an international news editor; a foreign correspondent in South Africa, Pakistan and Israel; and a local reporter. She joined The Post in 2003.